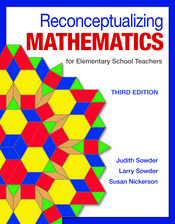 Reconceptualizing Mathematics, founded on research and studies of learning and mathematics teaching for many years, is designed for use in classrooms in which students take an active part in learning and experience doing math. The esteemed author team has written the only textbook of its kind to both incorporate aspects of student-centered learning into lessons and model the teaching that will be expected of their students. To this end, the authors provide worthwhile tasks, activities, and support for facilitating discussions. Quantitative reasoning and problem solving are recurring themes in Reconceptualizing Mathematics. The authors approach problem solving that teaches students to understand the quantities embedded in the situation and how they relate to each other.Maximize Teaching and Learning with WebAssign Premium Macmillan Learning and WebAssign have partnered to deliver WebAssign Premium – a comprehensive and flexible suite of resources for your math for teachers course. Combining the most widely used online homework platform with authoritative textbook content and Macmillan’s esteemed Mathtools, WebAssign Premium extends and enhances the classroom experience for instructors and students. Preview course content and sample assignments at www.webassign.net/whfreeman.